Cross trainers are athletic shoes that can be used for court sports such as tennis, low mileage jogging and for weight lifting. They are designed to provide stability to the foot and ankle for lateral movements and also the cushioning for jogging and resistance training. The idea is to have a shoe that is appropriate for more than one activity. Were you to train for marathons, however, you’d be better off getting a running shoe designed for that. You have flat feet if you barely have an arch on the soles of your feet. The best cross-trainers will provide support so that you do not create more foot strain. A natural arch in the foot is created by the plantar fascia muscles of the foot. Supporting naturally flat feet while doing sports is important, as the arches normally provide a literal springboard. 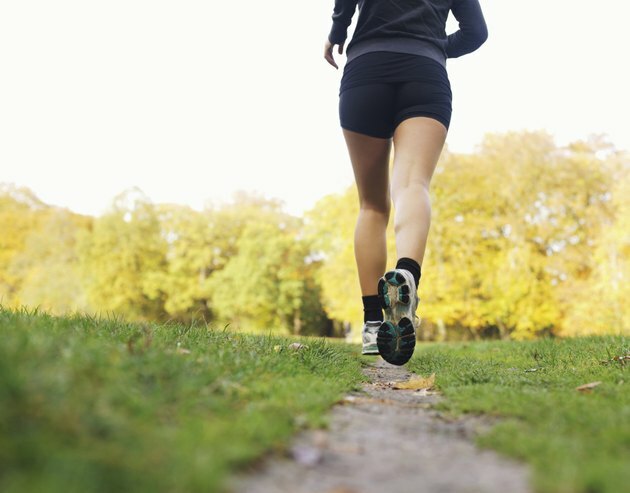 People who are flat-footed may develop postural habits that can predispose them to injuries. For example, if your ankles turn in, or pronate, you can appear to be “knock-kneed” and sometimes experience sensitivity in the inner knees for this reason. In this case, look for a cross-training shoe that provide “stabilizers” on either side of the forefoot that discourage pronation. “Test drive” your shoes by walking around in them and see if you can easily stabilize your feet — that they do not allow your ankles to turn inwards. Being flat-footed may also make you prone to having your ankles roll out, or supinate. This can be embarrassing if you are wearing street shoes and step off a curb and your ankle rolls out, causing you to turn your ankle. This can be corrected with therapeutic exercises and wearing appropriately designed shoes. In a cross-training shoe, look for a “stabilizing wedge” that is visible from the side of the shoe. This will be obvious and many cross trainers will be advertised as helping to prevent pronation. The wedge will help stop your ankles from rolling out. Again, walk or even lightly jog around the store in the cross trainers before buying them, to make certain you cannot roll your ankles out. For sports such as basketball, tennis or running, having this kind of lateral stability is especially important. Look for a lower heel in a cross trainer if you are going to jog in them. Some running shoes that are highly cushioned for a lightweight runner will have a highly stacked, taller heel. In that kind of shoe, you will feel tipped forward: the downside is that kind of shoe has very poor lateral support and stability. For jogging of less than 20 miles per week, you can generally use a cross trainer that has a low heel and appropriate cushioning in the mid sole for flat feet. For resistance training, tennis, basketball and running, you are bearing weight into all the joints. For a flat-footed athlete, look for a cross trainer that has a mid sole that will lift your natural arch up. When you are wearing the cross trainer, it will feel as if the floor has been lifted up to meet your feet. Most athletic shoes come with a removable shoe insert — use it or replace it with an even more supportive shoe insert designed for athletic use. The idea is to provide your flat feet with medial arch support to reduce creating foot strain. Thestretchinghandbook.com: What is Pronation and Supination?